Product #20894 | SKU SAC01UPRO | 0.0 (no ratings yet) Thanks for your rating! Allows you to make high-quality audio recordings to your computer. 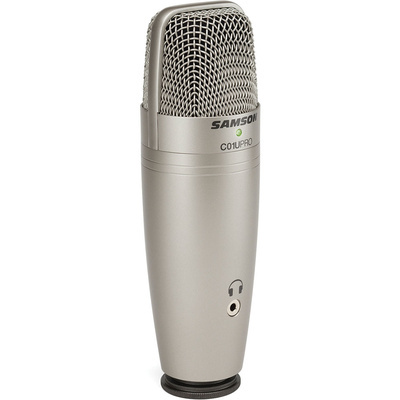 The C01U USB Studio Condenser Microphone from Samson allows you to make high-quality audio recordings to your computer without the need of any additional gear or cabling. The C01U is USB compatible with any Mac or PC, as well as most DAW software programs, including GarageBand. It comes with Cakewalk's Sonar LE digital audio workstation software so you can get started recording right away. The C01U's large, 19mm shock-mounted diaphragm with hypercardioid pickup pattern provides a smooth, flat frequency response. Capturing audio at 16-bit and up to a 48 kHz sampling rate, the C01U offers accurate, high-quality audio reproduction. The mic comes with a desktop mic stand, mic clip, USB cable and carry pouch.